Don't skip growth, even with retirement closing in. These three stocks could help you supercharge your returns. Being a 50-something might have you thinking about de-risking your investments. And while it's probably closing in on time to allocate some of your nest egg to low-volatility assets like bonds for money you'll need early in retirement, it's just as important to make sure your strategy includes long-term growth. After all, the odds are in your favor that you're going to live into your 80s. And three stocks that deserve a close look include insurance and investing giant Markel Corporation (NYSE:MKL), internet-only bank BofI Holding, Inc. (NYSE:AX), and fast-growth engineering consultancy NV5 Global Inc (NASDAQ:NVEE). Like most insurance companies, Markel makes most of its money by investing the float -- premiums they take in before losses are paid -- in short-term instruments like bonds. It also has generally had profitable insurance operations, while many of its competitors barely break even or even lose money on their insurance policies. But what separates Markel from most other insurers is that the company is more than just an insurer. 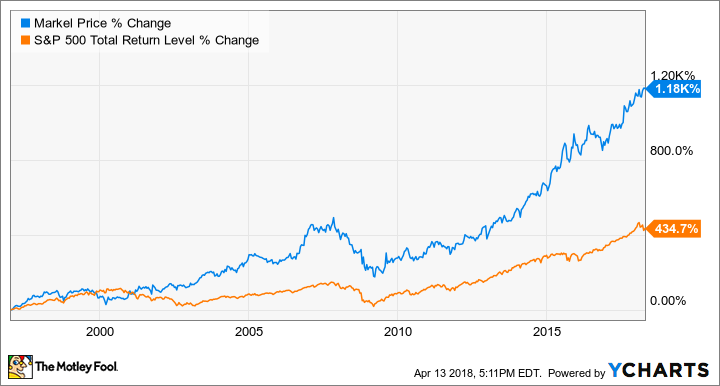 Under the steady hand of co-CEO Tom Gayner, who has led the company's investing efforts for multiple decades, Markel has steadily built itself into a cash-flow machine and investing powerhouse. Its equity portfolio was worth $6 billion at the end of 2017, having generated a 25.5% return last year, while its Markel Ventures subsidiary, which is comprised of subsidiaries the company has invested in or acquired outright, now generates almost 20% of total revenue -- it produced $65 million in net income for shareholders last quarter. The company also recently made a major acquisition to expand its U.S. operations, buying State National for $919 million. And I don't think its growth story is close to being over. 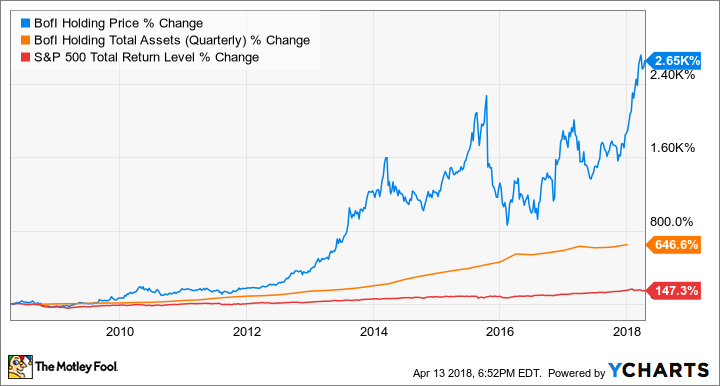 With a market cap around $16 billion, Markel really isn't that large, while its steady profitability, big cash flow, and valuable float provide Gayner and team substantial capital to keep putting to work. BofI Holding is one of the fastest-growing banks you'll find. 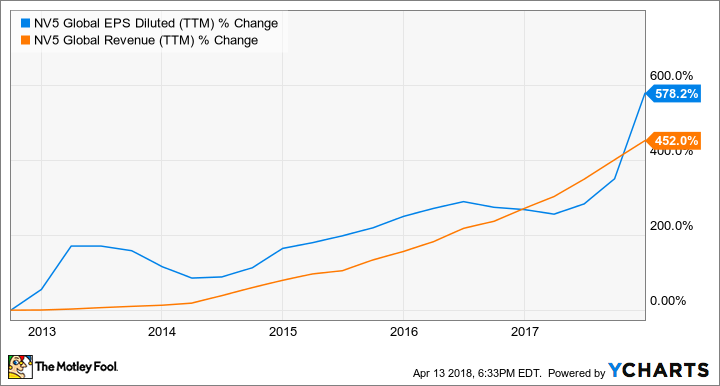 Over the past decade, it has grown from less than $1.5 billion in assets to almost $9 billion, while increasing earnings per share an incredible 1,740%. Shareholders in the bank have seen enormous gains over that period as well, with the stock price up 2,650%. That's good enough to turn a $5,000 investment in BofI in early 2008 into more than $132,000 today. BofI's growth story isn't over, either. With about $8.9 billion in assets and a market cap of $2.6 billion, its excellent management team should be able to continue generating market-beating growth for years to come. BofI's business model gives it a leg up over most of its large and regional banking peers. As an online-only bank, BofI isn't weighed down by the expensive branches that traditional banks still operate by the boatload. Where branches were once an asset that generated new business, they've become an albatross in many cases, simply adding expense while not bringing in new customers. This has caused many larger banks to spend money to close branches. Without any branches, BofI is substantially more profitable than most banks. Its efficiency ratio has consistently been around or below 40% -- meaning 40% or less of revenue is required to cover operating expenses. This is substantially less than most brick-and-mortar banks, which often sport efficiency ratios near or above 60%. This means BofI is able to dedicate more resources to growth, something that's certainly worked out over the past decade. This is a very real competitive advantage over most banks, and I expect BofI's management will continue utilizing it to deliver market-beating growth for years to come. Infrastructure is a massive global industry. It's also viewed as a relatively boring and slow-growth industry. But over the next couple of decades, a tremendous amount of money will need to be invested to support a global urban population -- on track to add 1 billion people -- and to keep the United States competitive. And one small company that's well-positioned to profit from this trend is NV5 Global. NVEE EPS Diluted (TTM) data by YCharts. But can this acquisitive model continue to work well? I think there's a reasonable chance that it can. To start, the engineering and infrastructure services sector is ripe for consolidation, with more than 100,000 individual firms operating in the U.S. alone. Many of these are small firms with relatively limited capabilities or geographical coverage. By combining these small firms under a bigger umbrella, NV5 has consistently generated higher profitability from its acquisitions. This has also delivered organic growth, since the bigger company is able to cross-sell services that smaller firms may not be able to provide, something management says has helped it grow faster than its competitors as well. Trading for 19.4 times 2018 earnings guidance, NV5 is attractively priced, especially when you consider that revenue was only $333 million in 2017. With a market cap below $650 million at recent prices, NV5 will probably be a volatile stock. But so long as management continues to deliver such strong growth, it has the potential to deliver incredible returns for investors willing to hold through the ups and downs.